He starts off by correctly condemning Trump’s attack on the air field, including his rush to do so. But right away, Greenwald runs into trouble, mixing up this correct condemnation with the implication that it’s equally likely that it wasn’t Assad’s forces who were guilty of the gas attack. While he’s right that we shouldn’t just take the word of the US government (or any other) for it, he ignores the fact that the only other explanation for what happened is the explanation coming from Putin & Co. — that the gas came from the bombs exploding at a chemical weapons plant, and the chemicals combined in mid air to form sarin. All the chemical experts so far say this is so unlikely as to be almost ruled out. Maybe they’re wrong, but Greenwald is sloppy at best, and dishonest at worst, for ignoring this. Result of Trump-ordered bombing of al Jinah, Syria. A great many on the left completely ignored this attack. And Greenwald implies it was also on Assad, which is totally false. This is downright dishonest. There’s no other way of saying it. He’s clearly implying that the policy of the US government has been and continues to be to arm “anti-Assad rebels” and that the previous attack back on March 6 was part of this. In fact, he even implies that the previous attack, too, was or might have been aimed at Assad. That is flat-out untrue and it’s hard to imagine that Greenwald doesn’t know it. Even under Obama, the policy was to support Assad, on the one hand by arming the Kurds, who in effect were fighting on Assad’s side, and by restraining the Southern Army from attacking Assad’s forces. He then continues to attack the Democrats for supporting Trump. Of course he’s right, but what does he expect? Something different? He excepts Tulsi Gabbard (D. HI) from his criticism, but he fails to mention that she is a Hindu nationalist and anti-Muslim bigot who supports the right-wing, sectarian Modi administration in India. (See here.) He doesn’t mention that Gabbard recently traveled to Syria as a guest of the fascist Syrian Social Nationalist Party. Greenwald leaves all this out because, underneath it all he sees no alternative to the capitalist politicians, but by failing to explain who Gabbard is, he helps foster the illusions in her that are fairly widespread on the left here in the US. Greenwald mixes up, confuses and misrepresents issue after issue. He pretends that there is nothing there as far as the attacks on Trump for his Russia connections. As this blog site has documented in a number of articles, Trump is inextricably linked to Russian capitalists, and given his entire orientation, it is impossible to imagine that this does not have a powerful influence on his policies. The problem for his capitalist critics, which Greenwald entirely misses, is that Trump is sacrificing the global interests of US capitalism for his own personal financial interests. Greenwald writes about the “wimp” factor and Trump wanting to prove he’s strong as if this were a personal matter. It has nothing to do with that. To the extent that Trump represents the mainstream of US capitalism rather than his own personal interests, he and his advisors understand that this bombing is part of a general change in US strategy and they want opponents of US imperialism – especially the North Korean government – to understand that. And that really gets to the heart of the matter. On issue after issue, Greenwald completely misses the class conflict, the clash of interests between workers and employers, between the working class and the owners of capital – the capitalist class. 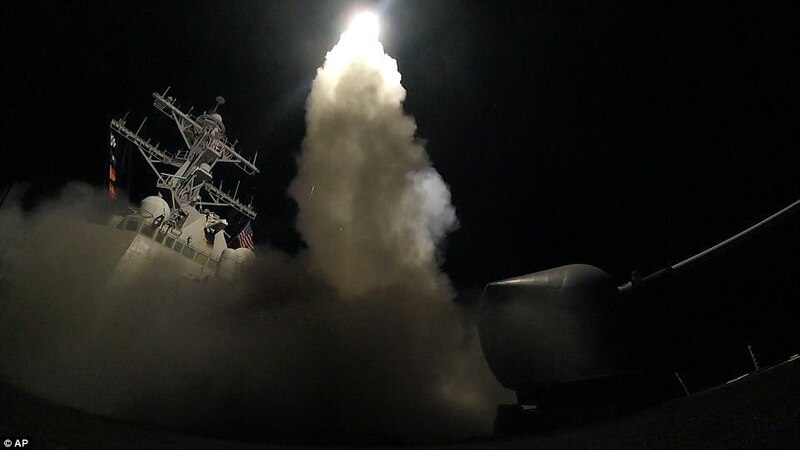 As a result, while he correctly condemns Trump’s most recent attack on Syria, he misses the main reason it should be opposed: Because as a member of and representative of the capitalist class, Trump cannot and will not do anything to empower his real enemy: The Syrian working class and their sisters and brothers the world over, including here in the US. Mobster-in-Chief Donald Trump: Life imitates art. Does it ever occur to you that this pro-imperialist drivel takes over right where Rachel Maddow leaves off? Just sayin. From Leila al Shami: “The US has been bombing Syria since 2014. According to Airwars, there have been 7,899 US airstrikes on Syria since then. 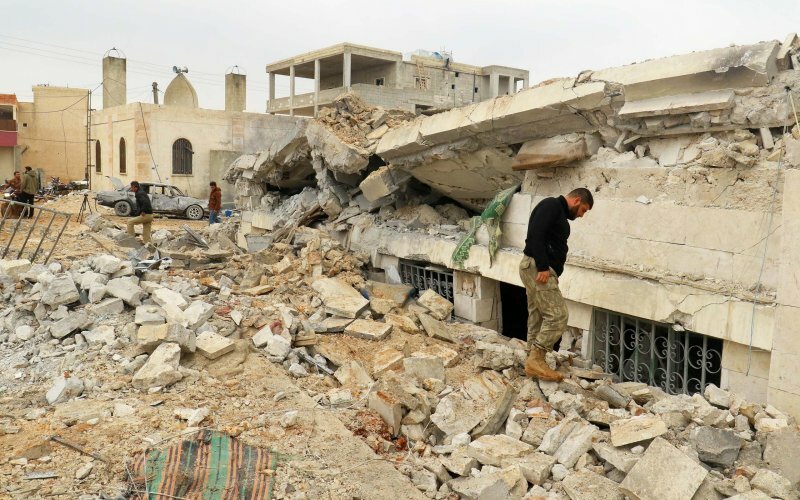 Last month over 40 civilians were killed when a US airstrike hit a mosque in Al Jina, Aleppo. A few days later a US airstrike killed over 150 people sheltering in a school in Mansoura, Raqqa. There was little public outrage, and no emergency anti-war demos. Just as no anti-war demos were organized when Assad gassed civilians to death in their sleep in Idlib.